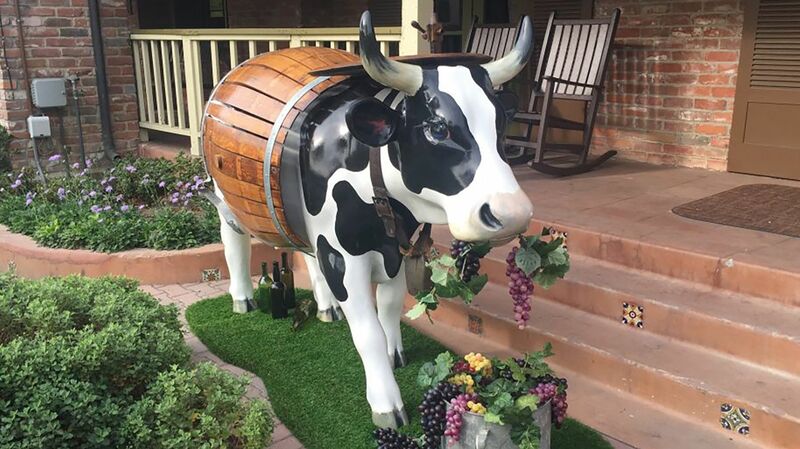 Next time you visit the Paso Robles Inn, you will be greeted by an udderly adorable, 120-pound, fiberglass cow named Clarabelle the Wine Cow. It's not everyday you see a work of art such as Clarabelle, but from September 2016 through May 2017, 101 cows were showcased across the county in participation of CowParade SLO at a variety of businesses and organizations until they were auctioned off for charity in early spring. Lucky for us, Clarabelle has found her forever home at the Paso Robles Inn and will remain in front of the hotel for years to come. CowParade SLO is part of an international movement that raises money for local non-profit organizations through a public art exhibit featuring life-size, 120-pound, fiber glass cows. 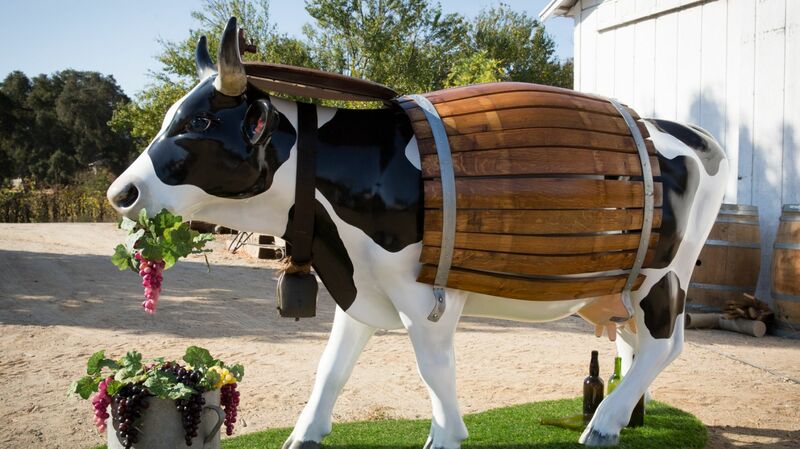 Before coming to SLO, CowParade has been featured in London, New York, Paris, Rome, and 71 other cities and towns. Since its start in 1999, CowParade has raised more than $3 million for charities across the world. Locally, the net proceeds raised from CowParade SLO after the auction in early spring will benefit the California Mid-State Fair Heritage Foundation, The Land Conservancy of San Luis Obispo County, and ARTS Obispo. As a sponsor, the Paso Robles Inn will donate the money raised by Clarabelle to benefit the Children's Museum in Paso Robles. The Children's Museum is a public charity that provides developmental opportunities for local children and families. The donations aid the museum in creating and maintaining interactive exhibits that encourage children to play, learn, and enrich their childhood through participation in educational programs. Clarabelle began as a pet project that took on a life of its own thanks to the herd work, dedication, and creativity of brothers Ken & Rod Gouff, and Rod's daughter, Christine Sedley. Christine, having seen a CowParade display previously in Chicago, was the one to encourage her family to take on this project. Inspired by the beautiful wineries and vineyards that stretch across San Luis Obispo County, and with Christine's passion for the project, Ken became the visionary and artist behind Clarabelle while Rod served as the engineer and problem solver throughout the construction of Clarabelle. From "Grape to Bottle" the family wanted Clarabelle to bring attention to San Luis Obispo County's growing wine industry that we're all so proud to be a part of, and it's safe to say they succeeded. 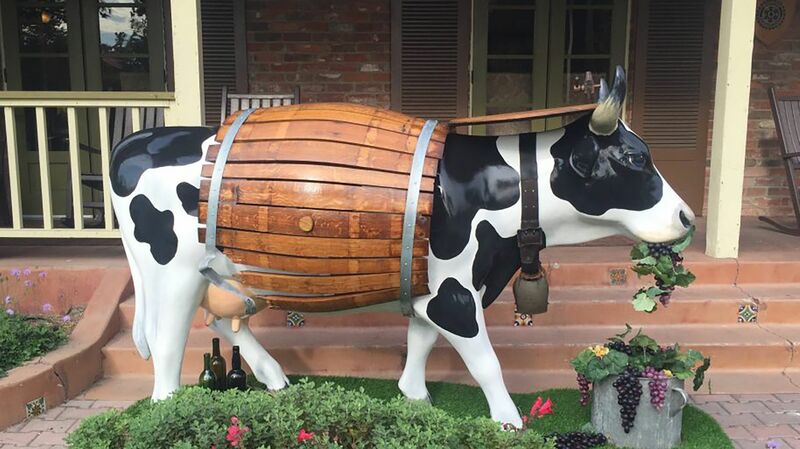 With her body stuck in a wine barrel and a mouth full of grapes, everyone here at the Paso Robles Inn can relate to Clarabelle's love for all things wine, and we hope you can too! We are so thankful to Ken, Rod, Christine for working with us on this worthy endeavor and we're proud to participate in CowParde SLO in the effort to enrich our community.